Catholic cemeteries are part of the ministry of the Roman Catholic Church. Through the Church, the Body of Christ, we are touched with mercy, love, grace and goodness from the womb to the tomb. Our bodies are temples of the Holy Spirit, baptized with water, anointed with oil, nourished with the Body and Blood of the Lord, touched with healing and love. Christ himself shared not only our nature, but also our very mortal bodies; therefore, we should always treat human beings and their mortal remains with respect, dignity and honor. In our Catholic Cemeteries, we carry out sacred religious functions [Canon Law 1205], create a place of care and prayer, and express the beauty of our relationship to God through graced environments that feature beautiful landscapes and mausoleums, spiritual artwork and sacred shrines. Here we can fulfill the Corporal Work of Mercy to Bury the dead along with the Spiritual Works of Mercy to Console the sorrowing and Pray for the living and the dead. Your Catholic Cemeteries attest to the unity of the living and the dead — a sign of the "Communion of Saints" in our midst. Your Catholic Cemeteries express in words, deeds and objects our belief in the sacredness of human persons, living and dead — whether male or female, rich or poor, powerful or ordinary. 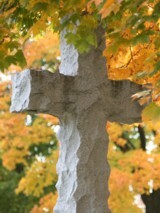 Your Catholic Cemeteries provide a focus for the Christian community for prayerful remembrance of the dead. Your Catholic Cemeteries speak of life beyond life, life after death.